Odor Out | Pro Chem, Inc. 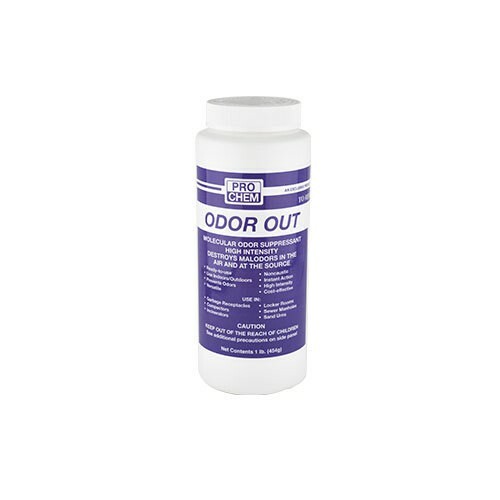 ODOR OUT is a granular odor control substance that destroys malodors at the source. It is specially formulated to provide control of unpleasant odors anywhere odors present a problem indoors or out, thus making it a truly versatile product. It is economical because a small amount is needed for effective, immediate results. ODOR OUT is dispensed by pouring or shaking. Use it sparingly – a little goes a long way. See label for specific instructions. General Use: For best results, sprinkle lightly into empty refuse and garbage receptacles. Add small amounts periodically or as refuse and waste are deposited to prevent odors from forming.